Water activated micro-scrubbers lifts away the toughest soils. Textured and 50% stronger than Magic Eraser Original for heavy-duty cleaning. Longer lasting and holds up tough messes better. Ideal for use on kitchen appliances, tiles and grout, and even grill grates, lawn furniture and more. 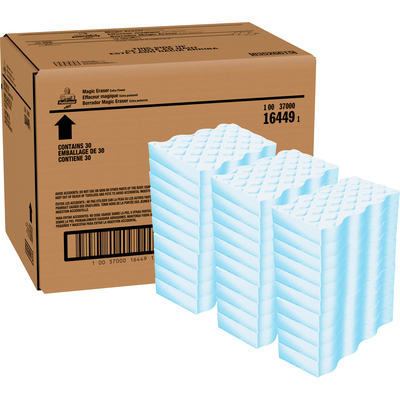 7920016192146 "Cleaning Pad, Melamine Foam, White, 4.25" X 2.63" X 1.38""
Innovative water-activated micro-scrubbers reach into surface grooves, lifting away the toughest soils with water alone. Textured and 50% stronger than Magic Eraser Original for heavy-duty cleaning. Holds up to tough messes better and lasts longer before you need to replace it. Ideal for use on kitchen appliances, tiles and grout, and even grill grates, lawn furniture and more.